Salamo is a striking, medium-sized tree of the Pacific dry forest and lower foothills premontane humid forests of Panama. It grows 5-18 m tall with a trunk diameter of up to 70 cm. Its multiple, straight fluted trunks with low branches and gray to reddish-brown bark are diagnostic, and the outer bark has vertical strips which peel to reveal the smooth, inner reddish bark. Leaves are simple and oppositely arranged, very rounded, up to 10 cm in length and 7 cm in width, with an abruptly pointed tip. Flowers are small and tubular, white and found in clusters above the leaves. Beneath each cluster are bright white calyx lobes. 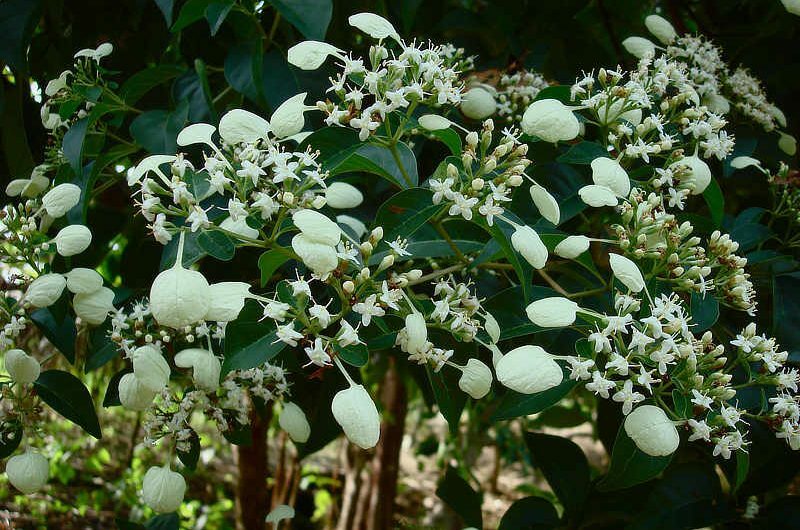 These calyx lobes make this attractive tree very conspicuous from a distance when flowering, and earn this tree its local name, “lluvia de plata”, or “silver rain”. Fruits are small, dry capsules that split to release winged seeds. Salamo flowers from November to March, especially in December during the earliest part of the dry seaon. Fruits are present from January to August, and mature in February and March. Salamo is found from Mexico to Ecuador, also in Cuba and Puerto Rico, and is the national tree of Nicaragua. In Panama, keep an eye out for this beautiful tree in the Pacific Lowlands during the dry season!